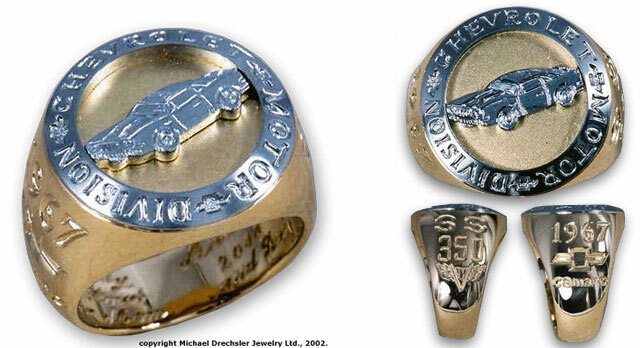 This custom designed, hand engraved, 14 Karat gold signet ring was created to feature the client's 1967 Camaro. Custom made Camaro ring designed for Kathy A. for her son. A very special gift created by Michael Drechsler Jewelry. I just wanted to write and let you know how pleased we have been with Andy's Camaro ring. The workmanship is excellent and you wouldn't believe the compliments he has received. I must tell you, I was very apprehensive about getting you to to do the ring. I knew nothing about you except what I had read on the internet, and I wondered if we could do something so detailed without being able to communicate personally. When you learned about my son's passion for cars and that this ring was going to be for his sixteenth Christmas you really got excited. You were always eager to answer any questions that I had and you would reassure me when I became worried about the project. We worked very well together and I feel like we have become best friends. The long distance between us made no difference and now I feel fortunate to have found you. I know that you and your employees worked very hard to make this ring and words cannot express how grateful I am. Thanks to you, my son has something he will treasure for the rest of his life, and I feel honoured to have been able to give him this unique gift. Michael, I highly recommend your work and would be glad to give anyone who is interested a reference on your behalf. I hope you are having a good year, and I look forward to working with you on future projects.